With shooting due to begin on Birdman in just a few weeks, director Alejandro González Iñárritu is having to put his cast together fast. At the beginning of the week it was revealed that Michael Keaton, Emma Stone, Naomi Watts and Zach Galifianakis had signed up, yesterday Edward Norton was added, and now Deadline reports that British actress Andrea Riseborough has joined the cast. The movie is about an actor (Michael Keaton) who years ago became very famous playing an iconic superhero, but who’s career is on the skids. In the hope of making a comback, he attempts to pull off a Broadway adaptation of a Raymond Carver story. However it proves incredibly difficult, thanks to his egotistical lead actor (Edward Norton). Andrea Riseborough is playing Jane, although no other info has been released about the character. Alejandro González Iñárritu is directing from a screenplay he co-wrote with Alexander Dinelaris. It’s going to be a big year for Riseborough, who’s got Welcome to the Punch, Disconnect, and Oblivion coming out in the next few months. This morning the nominees for the EE Rising Star Award were announced, which is the only gong given out at the BAFTA Film Awards that is voted for by the public. The nominees however were picked by a jury which included the likes of Tom Hiddleston and Mark Kermode. Previous winners (when it was the Orand Rising Star Award) include James McAvoy, Eva Green, Shia LaBeouf, Noel Clarke, Kristen Stewart, Tom Hardy and Adam Deacon. So who’s up for this year’s award? Well take a look at the info below and then head to ee.co.uk/bafta to vote! The winner will be announced at EE British Academy Film Awards on Sunday 10th February 2013. ELIZABETH OLSEN: At 17, Elizabeth moved to New York to study acting at the Tisch School of the Arts. After graduating she took Sundance by storm in 2011 when she appeared in not one but two of the most highly praised films in the festival: Martha Marcy May Marlene and Silent House. Most recently Elizabeth has completed production on the Spike Lee directed remake of Oldboy, opposite Samuel L. Jackson and Josh Brolin. ANDREA RISEBOROUGH: Andrea graduated from RADA in 2005 and quickly began to accumulate critical acclaim and awards for her stage and screen work. She made her film debut in Roger Michell’s Venus. Roles in Never Let Me Go, Brighton Rock and Mike Leigh’s comedy-drama Happy Go Lucky soon followed. Andrea has also starred as both a young Margaret Thatcher in Margaret Thatcher –The Long Walk to Finchley and Wallis Simpson in W.E. She recently finished filming opposite Tom Cruise in Oblivion, which will be released in April. SURAJ SHARMA: Until recently 19 year old Suraj was living a quiet, middle class life with his parents in the suburbs of South Delhi. But, after an extensive search throughout India, Suraj was picked from 3,000 hopefuls to star in director Ang Lee’s 3D epic, Life of Pi. Before taking on the role, Suraj had no previous acting experience. The director had complete faith in his young lead, describing Suraj as a “gift from god” and a “great actor in a past life”. JUNO TEMPLE: In just a few years, Juno Temple has firmly established herself as one of the most versatile and talented young actresses in Hollywood. Her breakthrough arrived when she won the role of Cate Blanchett’s rebellious, brooding daughter in Notes on a Scandal. This led to her appearance in the BAFTA- and Oscar-winning Atonement, opposite Keira Knightley, James McAvoy and Saoirse Ronan. Since then a variety of well received film roles have followed, most recently opposite Matthew McConaughey and Emile Hirsch in the darkly comic Killer Joe. ALICIA VIKANDER: Swedish born Alicia trained with The Royal Swedish Ballet for nine years before dedicating herself to acting. After appearing in several shorts and Swedish TV shows, she made her big-screen debut in Lisa Langseth’s Pure. 2012 saw Alicia burst onto the international scene with two major roles: Anna Karenina opposite Keira Knightley and Jude Law and the period drama A Royal Affair with Mads Mikkelsen. Recently Alicia has starred in the Warner Bros. feature The Seventh Son. Just this morning we posted the first poster for Oblivion and said we’d heard that the first trailer was due on Sunday. However the promo has slipped out early, or at least a Spanish subtitled version has, which you can see right here. In the movie the Earth is a ruined shell, with nearly all of the human population now living off the surface. Cruise plays a man who services the drones that ensure humanity can still get the natural resources it craves. However as we discover, some strange things are going on, including Morgan Freeman kidnapping him, some strange beasts and people in pods plummeting to earth. As he tries to figure out what’s happening, he becomes a target himself. It all looks pretty stylish and the visuals are certainly impressive, with what seems like a well conceived look at a world that’s been trashed so much people can barely survive on the surface any more. Joseph Kosinski’s film hits cinemas next April. 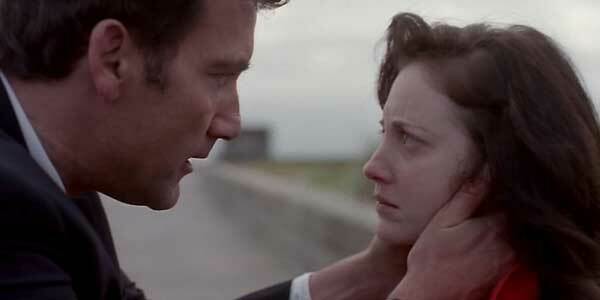 Andrea Riseborough (W.E., Oblivion) is an actress who’s flirted the edge of film stardom, but hasn’t quite made it yet. Now she has signed on to star in the Warner Bros. thriller The Hidden, which already has Alexander Skarsgard in the lead role, according to Variety. The movie is about a family who takes cover in a bomb shelter after a mysterious but deadly outbreak. The actress will play Alexander Skarsgard’s wife, who’s also the mother of their two children. Matt Duffer and Ross Duffer will make their feature directorial debut with the movie, working from their own original screenplay. Production is scheduled to begin later this year. It’s taken quite a while, but Joseph Kosinski is now pulling together the cast for his upcoming film Horizons (formerly known as Oblivion), with the latest to sign on, according to Deadline, being Morgan Freeman. Horizons follows Tom Cruise’s central character, one of the last people on an uninhabitable Earth who repairs space ships and keeps an eye out for alien attacks. The man goes on a journey of discovery when a mysterious woman crash lands on the planet. Morgasn will apparently play Malcolm Beech, the leader of the human resistance on Earth. Olga Kurylenko and Andrea Riseborough have been cast as the two female leads. It isn’t known when production will start on Horizons, but it’s believed to be relatively soon. The pic above is the first we’ve seen from the new Brit thriller, Welcome To the Punch, which follows in the long line of UK-based gangster movies. It’s an action thriller about a London detective (James McAvoy) and an ex-criminal (Mark Strong) who’s forced to return from his Icelandic hideaway. They become unlikely allies in a bid to expose a high-level conspiracy. The cast also includes Andrea Riseborough and Peter Mullan. The second movie from BAFTA nominated Colin Creevy, Welcome To The Punch is due out on September 7th. If all the film is as stylish as the pic above, it’ll be one to watch out for. On the script Creevy comments, “We wanted to be as ambitious as possible. People are held back by a budget and a concept sometimes, but I knew that if I made it good enough it wouldn’t matter.” And it might well be good as the script placed third on the 2010 Brit List (the UK version of the Black List of the best unproduced screenplays). The image comes via ScreenDaily which also has an interesting article about the making of the movie, which is worth a read is you’re interested in young filmmakers shooting for the stars. A couple of months ago it appeared Jessica Chastain was set to star opposite Tom Cruise in Joseph Kosinki’s upcoming sci-fi flick, which was previously titled Oblivion (and for a brief time Horizons). Now she’s out and Variety reports that Olga Kurylenko and Andrea Riseborough are in. The film follows a futuristic soldier called Jack, who’s one of the few people stationed on Earth after surface of the planet was destroyed by aliens. When he discovers a mysterious woman in a crash-landed pod, it sets off a chain of events that cause him to question everything he knows. It’s been previously reported that the two main female roles are Jack’s right-hand-man, Victoria, who acts as his eyes and ears on his repair mission, and Julia, who was his fiancee before the alien invasion. It isn’t clear which of those roles the actresses have signed up for. Jessica Chastain had to pass on the role to pursue Kathryn Bigelow’s untitled Osama bin Laden. It isn’t certainly when the film will shoot.